Chicago Mayor Rahm Emanuel on Feb. 19 in Chicago. On Tuesday, Chicago voters go to the polls to weigh in on Rahm Emanuel’s four years as mayor. If recent polling is accurate, Emanuel is the heavy favorite to win more votes than any of his competitors. What is less clear is whether he will clear the 50 percent threshold needed to avoid an April runoff. Like many cities, Chicago isn’t exactly accustomed to competitive mayoral races when there’s an incumbent on the ballot. Emanuel’s predecessor, Richard M. Daley, served as mayor from 1989 to 2011 and typically won re-election with north of 65 percent of the vote. So what’s holding back Emanuel? At the presidential level, political science has a clear and consistent answer for what influences support for incumbents: It’s the economy, stupid. Emanuel is no stranger to that idea, having worked on the 1992 Bill Clinton campaign that made the expression famous. To date, we’ve known a lot less about the systemic factors that tend to tilt mayoral elections for or against incumbents. 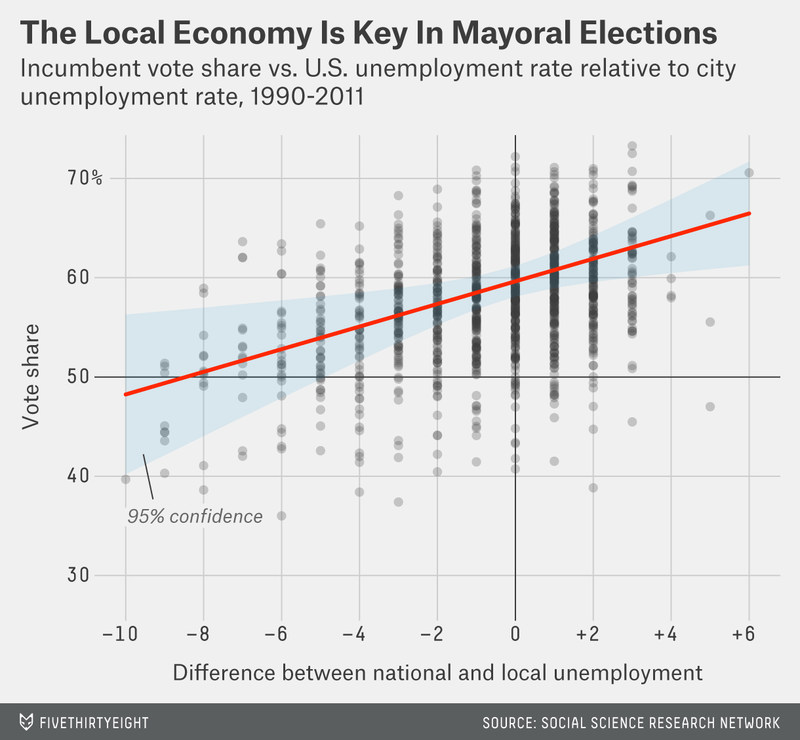 But research I’ve been doing with Georgetown University Ph.D. candidate Lindsay Pettingill suggests that it’s the economy there, too: Incumbent mayors tend to be blamed for weak economic performance relative to the country’s. And for much of Emanuel’s term, the unemployment rate has been higher in Chicago than in many other large American cities. Our research was interested in the factors that appear to matter consistently across big-city mayoral elections, from Chicago and Los Angeles to Denver and Montgomery, Alabama. We collected data on mayoral election outcomes between 1990 and 2011 and homed in on the 341 general elections in the 115 largest U.S. cities where an incumbent ran and the winner earned between 20 percent and 80 percent of the vote. This covered even the lopsided margins that put Daley back into office in Chicago, like the 69 percent he won in February 1999 or the 79 percent he won four years later. We then considered several potential predictors of incumbents’ vote share across cities. Crime and policing are major issues in many cities and routinely dominate local news coverage. As political scientists Douglas Arnold and Nicholas Carnes have shown, higher crime rates reduce mayoral approval in New York City. But we found no evidence that either high crime rates or spikes in crime correlated with incumbent performance across cities. And though local voters are frequently homeowners with a vested interest in property values, we didn’t find evidence that rising property values were a boon to incumbent mayors either. There’s another school of thought suggesting that mayors might be rewarded when cities feel good about themselves — say, because a local sports team has just won a national championship. (Granted, this research says nothing about the effect of having a prized local team stripped of its title.) But in our data, there is little evidence that a championship within a month of the election helps the incumbent. There’s an adage that in some corners of state and local politics, incumbents are more likely to leave office through death or indictment than defeat at the ballot box. But it’s worth thinking about the effect a cloud of wrongdoing can have on electoral success. A striking 13 percent of the incumbents in our data set were under investigation at the time of the election, typically for corruption. Those incumbents lost a sizable 6 percentage points on average when compared with mayors not being investigated, although some of them still managed to win re-election. What about the economy? It provides a single, widely covered barometer of conditions. But unlike their federal or state counterparts, many mayors have little leverage over economic policy. Some of the core policy arenas they do control — from land use and transportation to policing and (at times) education — typically influence local economies only years down the road. In 2013, Chicago’s unemployment rate of 10.5 percent put it 44th of the largest 50 cities. Even with a substantial drop in unemployment in 2014, the city’s jobless rate has continued to be above the national one. As late as last August, Emanuel was blaming the city’s economy for his poor polling numbers. This analysis suggests that he was right to do so. Or one standard deviation lower. We also tested models that included each city’s absolute unemployment rate. While absolute unemployment rates are relatively highly correlated with relative unemployment rates, it appears the latter is the stronger predictor of pro-incumbent voting.